Christopher shares an inspiring testimony about how God used him to call out the gold in a stranger he met. He was able to draw her a prophetic picture that really impacted her! One of my Create 28 students Gail shared this amazing testimony! I hope it encourages you to step out and take a risk like she did! This morning I saw something on FB about today being "International Women's Day." 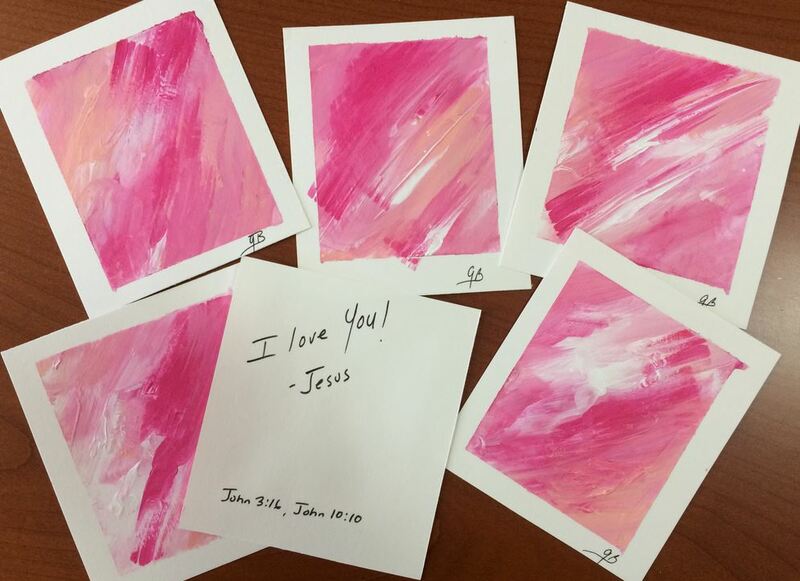 I had a GOD-thought to make some tiny pink abstract paintings and give them away as Love-notes from Jesus! I asked Holy Spirit to guide me to the women he wanted to touch. First one went to an Indian woman at the gas station. She was gracious. Then, the young woman who cuts my hair but who'd turned from God when her grandmother died of cancer years ago.. (But she's being wooed back!) Big Hug! Next, a tough-looking woman whose Mercedes was broken down in the middle of the road. Big Hug there! With only 3 left I was waiting for His leading... 1 went to a mall security officer who lit-up! And 2 more went to a pair of delightful young women in Anthropologie who had the sweetest responses: "Ohhhh.... I love this! I"m going to frame it! Come back soon!" "What a beautiful thing to do; we'll be sure to spread the Message!" I wish I'd made more!! Lyn experienced amazing breakthrough in her painting as she encountered God and discovered peace and rest in her Creativity!